Snuffles are caused by bacteria present in rabbits which have been through stressful periods – or have had immune system issues. Rundown rabbits will have nasal discharge, watery eyes, and matted paws. Make sure your rabbit is eating healthily and the hutch is cleaned out daily – you may need prescribed antibiotics to treat the illness. When the front of the eye becomes inflamed this may be a sign of bacterial infection – or it could be a corneal ulcer due to traumatic injury, or conjunctivitis from environmental irritants. An eye examination will diagnose the cause – and anti-inflammatory drugs may be prescribed to reduce swelling and alleviate pain. A crusty brown ear canal filled with tiny bugs is the indicator of ear mites – accompanied by a lot of ear scratching. Ear mites often live in the hay, so it’s a good idea to keep hay in a proper feeder. They need to be treated as they can cause serious problems if they spread to other parts of the body. Check ears regularly for cleanliness – when mites are caught early treatment is most successful. Often a few drops of vegetable oil in a dropper will smother the ear mites and relieve the crusty skin – don’t be tempted to remove the scabs as this can be painful, and they will heal naturally. Flea infestations happen when the flea inhabits the body of the rabbit and starts to reproduce – rabbits can develop a hypersensitive reaction and scratch excessively leaving lesions on the surface of the skin and skin infections. Heavy infestations may cause anaemia as the fleas feed on blood. Flea combing will produce flea dirt in affected rabbits, and your vet will eradicate and control exposure with specific powders and ointments. Rabbits are more accustomed to cold than heat – some breeds can tolerate temperatures of up to -10 degrees centigrade. If exposed to high temperatures without a cool shelter or water they can suffer from heat stroke and can die from cardiac arrest. Symptoms include continuous panting and stretching all four legs out evenly to cool the stomach on the ground. You can gently spray your rabbit with cool water – but vet intervention may be needed with IV fluids. Use a fan to circulate cool air around your rabbit, and freeze water in bottles to provide ongoing cooling aids. This disease is also fatal in rabbits – a syndrome that causes them to stop eating, passing stools, and become bloated with tract gas, faecal material, and dry mats of hair. One of the most common causes is a diet too high in carbohydrates and fat – and too low indigestible fibre. Your rabbit won’t eat and will get dehydrated and stop moving. Your vet will need to run blood tests and administer fluids – treatment may need to be carried out at the animal hospital. Myxomatosis is the most serious infectious disease affecting both wild and pet rabbits – the symptoms include skin lesions, anorexia, lip, nose, eye, and genital swelling, causing death within 12 hours if contracted. A single vaccination annually will prevent any infection and screening the hutch to keep out insects and fleas are also effective preventative methods. Baby rabbits can be vaccinated from five weeks old. This occurs when flies lay their eggs in dirty or matted fur –usually around your rabbit’s bottom. This is excruciatingly painful as the maggots eat skin and flesh, and can even start to devour the intestines when they enter into the body. Your rabbit will huddle in a corner and may scream and collapse with the pain. 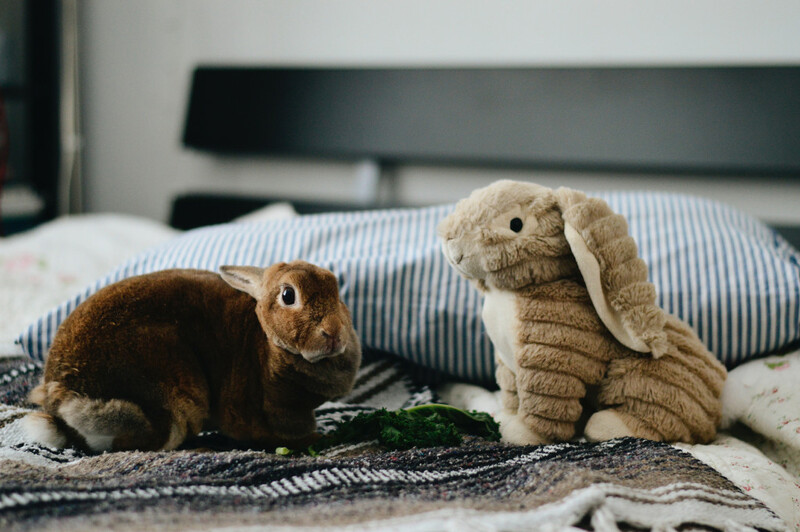 It’s essential that you keep your rabbit clean on a daily basis and ensure your rabbit is never sitting on soiled bedding. Limiting the amount of fresh vegetables that may cause diarrhoea will prevent fly attraction – and watch particularly carefully for flies from April to October. As many as one in three rabbits suffer from weight-related problems – lack of exercise, diets too high in starch and low in fibre, and the fact that rabbits have a sweet tooth are all contributing factors. Carrying too much weight puts your rabbit at risk of heart disease, diabetes, and fatty liver to name just a few health issues. Weighing monthly and adjusting diet accordingly with an egg cup full of pellets and plenty of good quality hay will prevent excess weight gain. Over 60% of female rabbits over three years old will experience a malignant type of tumour in the uterus. Age seems to be the most important factor – the presence of blood in the urine is a common finding, alongside cysts, behavioural changes, lethargy and eating issues, and abdominal masses. Treatment may include a complete hysterectomy with follow up care of chemotherapy and medication for pain management. Cloud 9 Vets is a trusted provider of gentle pet euthanasia in your own home. If your rabbit illness has come to point when medication and treatments aren’t working you may need to discuss pet euthanasia to prevent any further suffering. You’ll be given all the advice and support you need at this difficult time from trained and caring practitioners. Gentle pet euthanasia at home may be the best way to say goodbye to your closest rabbit friend.